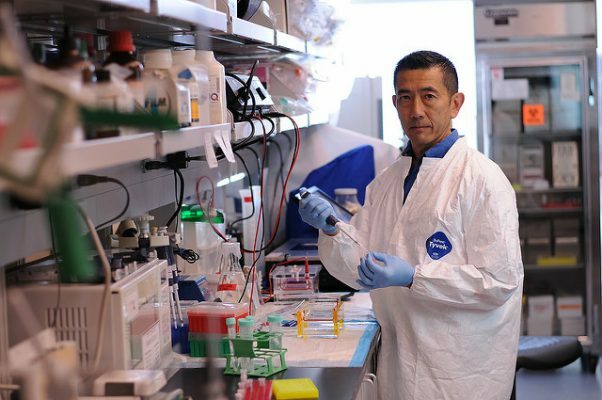 Dr. Bruce Shiramizu is a Pediatrician and Cancer Researcher, an investigator with the University of Hawaii Center for AIDS, and a dedicated mentor to young scientists through his work with the St. Baldrick’s Foundation. Every summer, Dr. Shiramizu mentors an outstanding young scientist in his Hawaii laboratory, and takes part in the “Shave-a-thon,” going bald to raise funds for cancer research. This year, The St. Baldrick’s Foundation profiled Dr. Shiramizu’s work and allowed us to reprint and link to it here. Because as usual in Hawaii, our scientists are quietly focused on their research, and less likely to speak about their own accomplishments, which in this case, are pretty impressive. It’s why this Hawaii-based doctor, who has worked on the mainland at the University of California San Francisco (UCSF) and at the National Institutes of Health (NIH), is so passionate about his research work and what it might be able to do for children throughout the world. This veteran researcher has shaved his head multiple times for St. Baldrick’s – that’s one definition of a “Rockstar Researcher” – and his body of work speaks volumes. The research centers around “Raman spectroscopy,” a concept probably not that familiar to everyone – and especially foreign to those in the medical world. Named after an Indian scientist, Dr. C.V. Raman, Raman spectroscopy is a laser technology that is most often used by physicists and engineers. Acting almost like night-vision goggles, these lasers are used in the military to analyze the presence of explosive or combustible chemicals. Shiramizu and his research team decided to aim the lasers at cells in the body instead, and initial results were quite promising. The lasers showed unique abilities to identify molecular fingerprints of cancer cells, creating the possibility that diagnosis could be more precise and, potentially, a lot quicker. For patients who have non-Hodgkin lymphoma, an accurate initial diagnosis can be a real time saver; but, sometimes, what might appear to be a tumor on the outside, could, in fact, be just an infected lymph node. Currently, a biopsy is the best way for doctors to make a diagnosis. Raman spectroscopy might change all that. “Having this tool to probe whether or not a lymph node, for instance, is cancerous or just infected can provide additional assurance to patients and to parents,” Dr. Shiramizu said. Because of the physics of Raman spectroscopy, water molecules don’t have the same effect on the way light refracts with lasers – which means that this technology has already been used for wound analysis and care. Turning the tables on cancer tumors, which is where Dr. Shiramizu’s St. Baldrick’s Foundation grant came into play, gave the doctor the chance to check for minimal residual disease – sub-microscopic cells that may still be in the body after treatment – and help doctors zero in on the proper course of medicine. 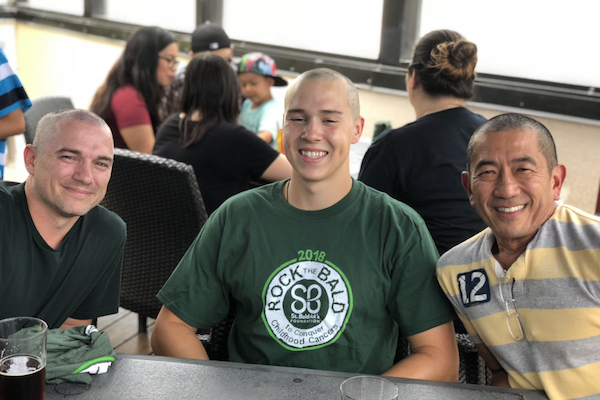 One obvious question for Dr. Shiramizu, who works at the University of Hawaii John A. Burns School of Medicine, is why he got involved with St. Baldrick’s. “When I was at UCSF, 60% of the time I was taking care of children with cancer. On the island, it’s 100% focused on research – so the St. Baldrick’s connection helps me to feel kinship with the children and families fighting cancers,” he said. St. Baldrick’s April Shave-athon Fundraiser: Team “Shaven Things” after the 2018 haircuts. L-R: Scott Bowler, Mark Briscoe, Dr. Bruce Shiramizu. Tiffany Shieh photo. For the record, this is the ninth straight year that St. Baldrick’s will hold an event in Honolulu. To get involved for the April 28th event, visit our website. Since the Hawaiian Islands are geographically isolated, his hope is that the pipeline of research and researchers can lead to more discoveries, and a stronger bond with folks in Hawaii and throughout the world.